Database>dBCreate/Modify enables creation or modification of dBase files. The next graphic shows the structure of the original Census-sourced gz_2010_us_050_00_500k.dbf. 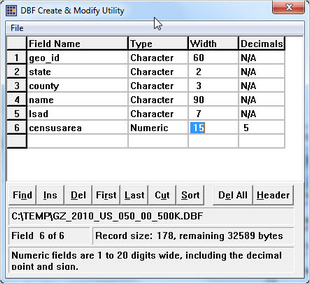 The original dbf (dBase) file has been modified (see above section) so that the field name "censusarea" is numeric, 15 characters wide and had 5 decimal positions (changed from 31 characters with 15 decimal positions as used by Census). The File>Open operation is used to open the dBase file. Once opened, the structure of the dbf is shown in the grid. Attributes of each field in the dBase file are shown by row. There are six fields in this dBase file. Attributes of each field are shown in the four columns. The field name must conform to dBase naming conventions that include no special characters, no duplicated field names and a maximum width of 10 characters. Valid field types are character, numeric, logical, date, float and memo. Most of the operations discussed here are focused on character and numeric. Field modifications should be made only by users familiar with the dBase naming rules and possible implications of modifying a field attribute as it might affect use of that field. Key issues include that geocode fields, such as state and county in this file, should not be changed to a numeric attribute even though that is technically possible. Field Renaming. Provided the new field name conforms to dBase structural requirements, a field can be renamed. Use the File>Save operation to save the file with the new field name(s). This will overwrite the existing dbf file with the new field names. ** do not combine adding/deleting fields with any other modification operations (like rename). • click on the field where the new field is to be inserted. • click the Ins button. • a new field area is created. • add the correct name and attributes the new field. • use File>Save to save the modifications to the file. • if done, exit dBCreate. • recommended -- review the modified file using dBrowse.